Yeah and I'd like to know that, even though Finlands U2s fan base is small at only 0.42%, why do U2 always chooses to play in Sweden, whose fan base is only 0.33%, instead!?! Good thing about U2 is, they've done so much, there's something for everybody! "Nothing is better than Bono in leather." Ain't it great? I like your Avatar, Simply Confused. I SO agree with you. Pop in my opinion was the worst fashion era. The Pop chop, the muscle shirt, the wife beater tanks.... adam's outfits, etc. And yes the mullet was hot back in the day. Oh I was a voter in that poll!! Then I forgot all about it and never went back to see the results. Thanks for the link! Very interesting. Oh and this is for you Beverly56. 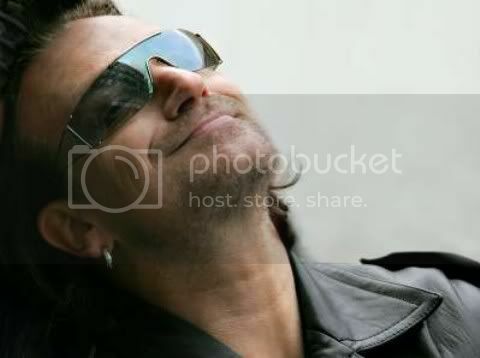 SC's icon is great, it's been my fave Bono smile since I 1st saw it. I almost made it my icon too, so I was so happy to see SC using it because now I still get to see it around here! Location: "Greatest Bonolover in Finland"! Yeah and I doubt if very many Finnish fans took part in this survey either. I know I didn't, I just happened to come across the results the other day while surfing another U2 forum. And there's no need to get snippy, I wasn't attacking Swedes or U2s Swedish fans (our beloved enemies! ), I was just complaining about U2s policy of nearly always leaving Finland out of their touring schedule dispite the fact that they have quite a substantial and loyal fan base here.